Boston College is a highly competitive school and its admissions statistics make Boston College one of the 50 most competitive schools for undergraduate admissions globally. 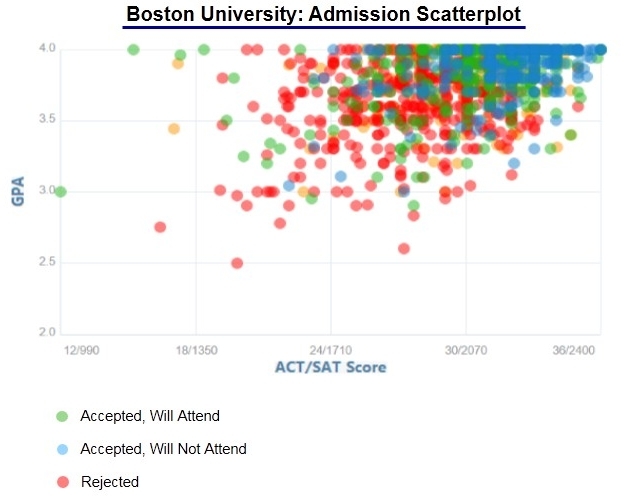 Similar to the trends across all top schools, Boston College acceptance rates have continued to decline over the past 8 years and will almost certainly continue to do so into the future. 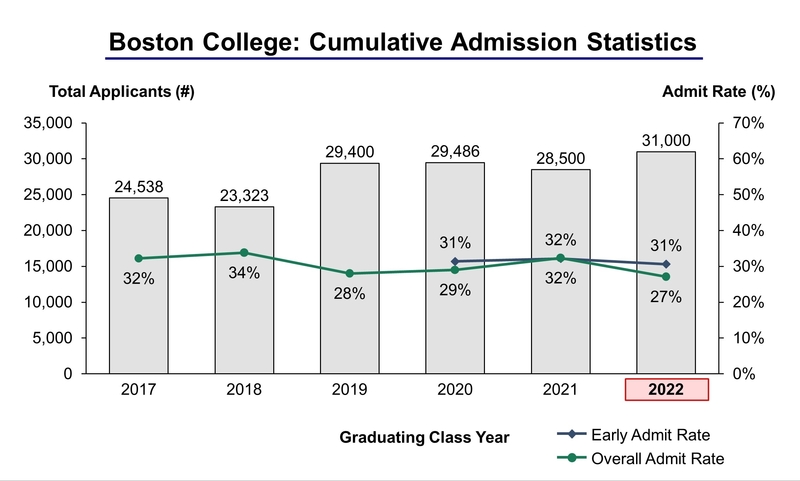 The Class of 2022 was the single most challenging year to be admitted to Boston College ever. For the Class of 2022, 31,000 students applied to Boston College of which 8,400 students were accepted, yielding an overall acceptance rate of 27.1%. Overall applications increased by 8.8% over last year (2021 to 2022) from 28,500 to 31,000. For the Class of 2022, 3,170 students were admitted through the early admissions process. Total early applications totaled 10,360, yielding an early acceptance rate of 30.6%. Early applications increased by 15.1% over last year (2021 to 2022) from 9,000 to 10,360. Founded in 1863, Boston College has maintained its Roman Catholic Jesuit religious roots and has become one of America’s leading private research universities. Boston College is now ranked thirty-first among national universities by U.S. News & World Report. Over recent years the university’s students have received a number of prestigious academic scholarships including Rhodes Scholarships, Marshalls, Goldwaters and Fulbright grants and more. Boston College is well known for its extremely competitive Presidential Scholar scholarship program which is awarded to only fifteen people, equal to less than a one percent acceptance rate. Some of the university’s most popular majors include Economics, Finance, Communication, Biology, Political Science, Psychology, English, Nursing, Applied Psychology & Human Development, and Accounting. Boston College is also known as a university with high research activity. It has highly ranked graduate programs including the Lynch School of Education, Boston College Law School and the Carroll School of Management. An example of notable alumni in the areas of education, law and business include Peter Dervan, former Chairman, Division of Chemistry and Chemical Engineering at the California Institute of Technology; Brigida Benitez, President, Hispanic Bar Association and proposed alternative nominee for the United States Supreme Court; and Nikesh Arora, President, Global Sales Operations and Business Development at Google. In all, Boston College has more than 160,000 alumni worldwide, and maintains one of the largest alumni association among Catholic universities in the world. Boston College has eight schools and colleges that enroll 14,100 students with 9,000 of those being undergraduate students. There are 4,500 graduate and professional students and 600 students in the Woods College of Advancing Studies that make up the remainder. Boston College’s undergraduate programs consist of its College of Arts & Sciences, Carroll School of Management, Connell School of Nursing, Lynch School of Education and Woods College of Advancing Studies. Although Boston College has no fraternities or sororities on campus, the university has more than 200 clubs and organizations broken up into the following categories: Academic/Pre-Professional, Campus Ministry, Honor Societies, Intercultural, Music, Art and Performance, Political, Publications and Media, Service and Specific Issues. When it comes to sports, the Boston College Eagles boast one of the highest graduation rates for student-athletes in the country. Most classes have 10-19 students. We were impressed with Sam. He is a sharp, thoughtful young professional with impeccable academic credentials. To say we were pleased with the work and advice Sam provided would be an understatement. Our son was a challenging student to work with. He had very high SAT and AP scores but his GPA reflected a student who wasn’t particularly engaged. In his junior year, he decided Southern Methodist University (SMU) would be his first choice. The college counselors at his high school thought SMU would be a reach for him due to the difference between his grades and his test scores. They didn’t particularly encourage him to apply, and they suggested a number of weaker schools. I always felt conversations with his school counselors were rushed with formulaic advice. Sam, by way of contrast, was extremely attentive. His guidance was thoughtful. There was never a question in my mind that my son’s best interests were Sam’s top priority. My son ultimately applied as an early-decision applicant to SMU, choosing to follow Sam’s guidance over the guidance offered by his school counselors. The school counselors suggested his essay was inappropriate because he discussed a summer working for a US Congressman running for the US Senate. The school counselors felt the essay didn’t say enough about him. Sam believed the essay, which focused on the political process in the United States and his feeling with respect to how it was failing its citizens, said more about him than any typical college essay.